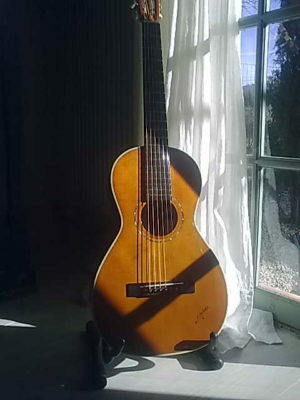 The RAG65MH LH is a Masterworks acoustic guitar. This is a truly surprising guitar in so many ways. A generous sound, superbly balanced, with astonishing projection. Intimate and polyvalent with a vintage approach. The top is dark honey tinted solid spruce, the back and sides are solid Gabon mahogany. Perfectly adapted to finger style players and older styles like ragtime, but not only. Modern stage players enjoy the small body and the comfort of the neck. A true left hander with all bracing hand carved and voiced by the master craftsmen at K Yairi workshops. This guitar is actually hand signed by K Yairi himself, and so is a true collector’s piece. Dominic Miller's Rag at home.